Sober Look: Greece prepares bond buyback, but there is always plan "B"
Greece prepares bond buyback, but there is always plan "B"
Greek government debt yield hit a new post-restructuring low, nearing 16%. Who is buying this paper? 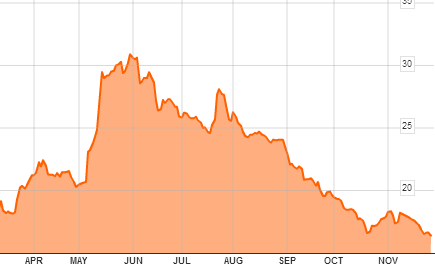 The Greek government of course (plus those who bought these bonds for speculation). The idea is for the government to buy debt at a discount and "retire" it, reducing the indebtedness level by the amount of the discount. NY Times: - The troika has calculated that if successful, the debt buyback, together with other means of debt relief, could help Greece reduce its debt to 124 percent of gross domestic product in 2020 and even further after that, from about 175 percent now. But the current holders, knowing this information, may try holding back to see if they can get a better price, now that there is a big buyer in town. Plus those who have not marked this debt to market (which apparently is the case for some Greek banks) will realize a loss upon sale and may not be eager to sell right now. NY Times: - a number of hurdles remain that could mean delays in reducing Greece’s debt. For one, Athens will also have to persuade bondholders to sell back their debt at a price that is attractive to the government. Bondholders will hold out for as much as they can get. In addition, some of those bondholders are beleaguered Greek banks. The government bonds they hold count as bank capital and pay a high rate of interest, reflecting the risk attached to the debt. Writing down the value of the bonds, and forgoing that capital and income, will eventually leave the banks even worse off than they are now. That may require the troika to send even more aid to Greece in the future to recapitalize the banks, analysts say. As it is, nearly 85 percent of the coming installment of bailout aid has been set aside to shore up Greek banks, which have virtually stopped lending. Obviously Greece will be doing this debt buyback with borrowed money - using a loan that is in addition to the money the Eurozone leaders agreed to release this week. NY Times: - The loans needed to carry out the buyback would come on top of the money that European officials and the I.M.F. committed to release after marathon talks in Brussels this week. And if the government can't buy enough of these bonds, there is always Plan "B". NY Times: - Mr. Stournaras said that if the program failed to attract sufficient interest from the banks and insurers that hold the government’s debt, officials had drawn up a “Plan B.” He refused to elaborate. We should know the results next week.